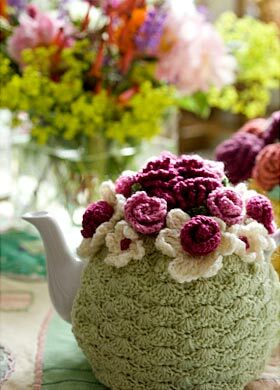 Love the tea cosies and are those Ragged Roses Lavender sachets I spy there? There are some wonderful yellows in the garden, rudbekias, bidens, thalictrums,evening primroses, anthemis,mix them with white feverfew or white willowherb [epilobium] and the ubiquitous alchemilla. lime green and white with yellow is a wonderul combination, the list is extensive.. perhaps there is an article here! Deborah – It isn’t that I have a blanket dislike of yellow flowers, it is that the colour doesn’t combine so nicely with pinks and greens. 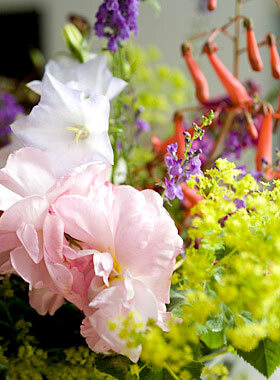 On their own, all the flowers you mention are lovely or mixed as you say, with other specifically chosen flowers. They don’t mix so well in a random way. Am I still middle class? Cutting your own bunches of flowers has to be my absolute favoutite, though my garden groans everytime I head out there with the secateurs! 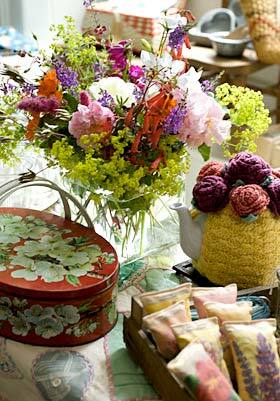 I know what you mean about ‘yellow’ flowers – I guess a few in a bouquet can just about be OK, for me that is. ps. I have just stumbled across you blog! I must confess to not being a lover of yellow flowers although.. ox eye daisies are magnificent in their droves.. as are my dazzling day lilies..
A little splash of gold is better than none..
Love the new photos on the website…!